3D Browsing is so new that WE have the opportunity to set the standards! Yes, that means you and I working together to define the future of 3D Browsing! 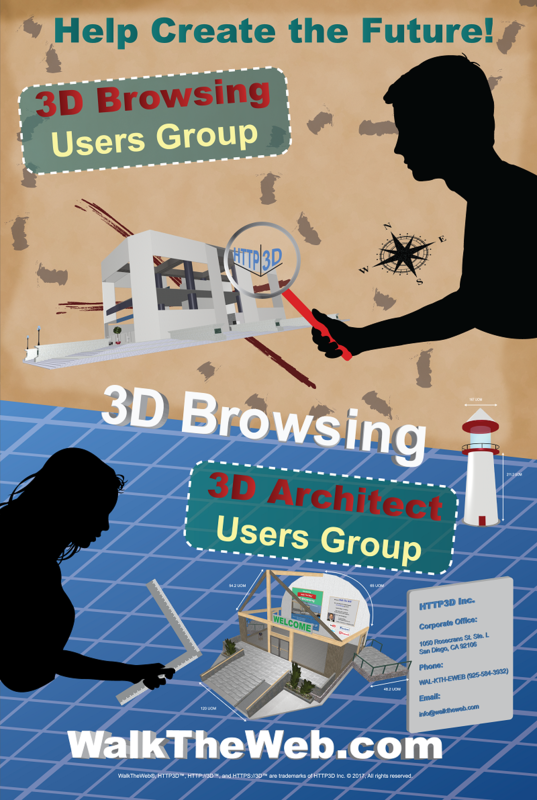 HTTP3D Inc. is currently hosting two FREE Users Groups to support the 3D Browsing Project; 3D Browsing Users Group and the 3D Architect Users Group. The 3D Browsing Users Group was created so that everyone can assist, be heard, and help us make sure the the 3D Websites work well for everyone. These users are the Testers. Members of this group will be notified as there are new things to test including: 3D Websites, Games, functions, features, avatars, and animations. The 3D Architect Users Group was created to support anyone that wants to help create 3D Websites. These users are the Builders. Members of this group will assist in building 3D Websites, perfecting the development tools, writing 3D Browsing Design Standards and Guidelines, and have the opportunity to receive extended training in creating 3D Communities, 3D Buildings, 3D Things, 3D Games, and animations. They will also receive information to assist in making the best optimized flowing scenes. You do not have to be a Coder (Programmer) to be part of this group, but Coders will have additional information provided from time to time.